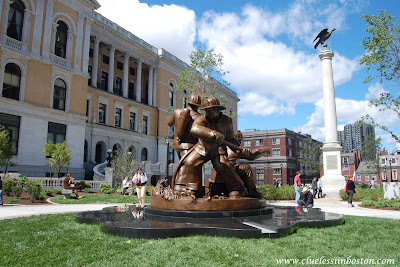 A memorial to all the fallen Massachusetts Firefighters was dedicated at the State House on Tuesday, the anniversary of 9/11. The statue is 11 feet high and weighs 3,000 pounds. It took nine months to design but more than nine years to raise the money and backing to erect it. All around the statue are listed the names of fallen firefighters and the cities and towns they gave their lives for. It looks a very dramatic memorial, as it should be. Firefighters take such great risks.